The first of the birthstones, garnet is the stone for January. This dense mineral may occur in every color except blue. The most popular in the garnet group are either Pyrope Garnet (deep red) or Rhodolite Garnet (purplish red). The type is determined by a composition containing either magnesium or iron in the “X” position of the chemical formula. Although garnet is most highly prized as a faceted stone, industrial grade garnets are used as abrasives in sandpaper. The birthstone for February, amethyst is the most valuable variety in the quartz group. Its purple coloring is caused by impurities of iron or manganese. The word amethyst is Greek for “not drunken,” and is considered by some a sobriety stone. Citrine is a variety of quartz colored yellow by the presence of iron. Citrine is not generally recognized as a birthstone, but may be used to substitute Imperial Topaz due to its affordability and abundance. This gray colored mineral is relatively common and is popularly faceted for jewelry. The smoky color is due to natural gamma rays. Tinted by titanium, this variety of quartz almost always occurs in massive form, rarely in crystals; this phenomenon is somewhat of a mystery to the mineral collecting community. Their massive form in no way prevents faceting; they are among the most beautiful colors of quartz used in jewelry. While clear quartz is of interest to collectors, it is not generally prized as a faceted stone. Some consider an uncut crystal to be good luck if left in its natural terminated form. This very abundant mineral has many industrial uses including glass manufacturing, silicon semiconductors in computers, soaps, ceramics, abrasives, and as oscillators in radios, watches & pressure gauges. Derived from the Latin word for red, ruber, ruby is the birthstone for July. This form of corundum is tinted red by the presence of chromium. Rubies are second in hardness only to diamond and exceptional crystals may exceed diamond in value due to their rarity. Be on the lookout for color and shape when hunting for rubies; they tend to be hexagonal (six sided) and either elongated or flattened. This precious gem is the birthstone for September. Sapphire is a form of corundum generally thought of as being blue. While this may be the most popular color in sapphire, it may be found in a range of colors from colorless, pink, green, or yellow. Blue is the most valuable color of sapphire & the most valuable of all blue gemstones. Like ruby, sapphire is second in hardness only to that of diamond. This property makes it a desirable gemstone due to its hardness and durability as well as its beautiful color. Sapphire also occurs in hexagonal crystals; therefore color is not the only distinguishing characteristic for identification. The May birthstone is the most precious in the beryl group and the most precious at our mine. The name is derived from the Greek word smaragdos, meaning "green stone" whose color results from the presence of chrome. Gem miners frequent the Greater Foscoe Mining Company from all over the globe to find North Carolina Emerald. The appearance of emerald crystals may be disguised by associated minerals such as biotite mica and/or graphite. Be on the lookout for any of these minerals as well as the light to dark green massive or hexagonal crystals when hunting for emeralds at our mine. The March birthstone is named for its seawater color which results from the presence of iron. Like emerald, aquamarine may exhibit massive or hexagonal crystals. Deposits of aquamarine are becoming scarcer and therefore a more valuable gemstone to collect. The most common form of topaz, the November birthstone, is white or colorless topaz. However, it is possible to find other colors of this semiprecious stone. Light blue topaz may occur naturally, but a more stable and desirable color of blue results from heat treatment of naturally light blue or colorless forms of topaz. The light blue color can be further heated resulting in a more intense and therefore more valuable color of blue, known as London Blue Topaz. Topaz crystals tend to have very smooth surfaces, either planar or rounded. The most valuable and rare of the topaz group is Imperial Topaz, which commonly occurs in relatively small, striated cubes. The color may range from an orange-yellow to an orange-brown. The tourmaline group contains the widest range of colors found at the Greater Foscoe Mining Company, hence the derivation from the Sinhalese word, turamali, meaning "stone with mixed colors." Tourmaline, one of the October birthstones, may occur in most any color/colors imaginable, but many are more popular and abundant. Look for elongated crystals with striations and a black exterior to recognize tourmaline. While the outside is black, the interior may contain a range of colors, the most popular of which is a variety known as Verdelite Tourmaline, derived from its green color. 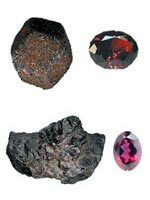 Other occurrences are blue, (Indicolite Tourmaline), reddish-pink (Rubellite Tourmaline), and pink and green (Watermelon Tourmaline). Any combination of the above colors may unite to form bi-colored or multicolored tourmaline. The other birthstone for October, Mexican Opal, is also known as "Fire Opal", due to its fiery orange to red color. Opal is a very unique stone because it contains water; which may be up to 30% of its chemistry. Many myths surround opal including tales of curses and bad luck associated with wearing the stone. Its appearance is usually very striking making it an easy one to identify. Peridot is the birthstone for August and is the transparent gem variety of the mineral olivine. Individual crystals of peridot are very rare, especially if it is sizable enough for faceting. Maintain a very keen eye for spotting this rare gem, it is sometimes found is sizes comparable to that of a pin head. Iolite is a transparent, light blue to lavender gemstone. It occurs in masses, sometimes found at fist size at the Greater Foscoe Mining Company. It is usually found in very irregular shapes and in colors sometimes unnoticed unless wet or in direct sunlight. However, when faceted this semiprecious stone takes on the appearance of a precious sapphire or tanzanite; hence the nickname "Water Sapphire."